Converted from RAW, with normal adjustments. Cropped and saved for the web. 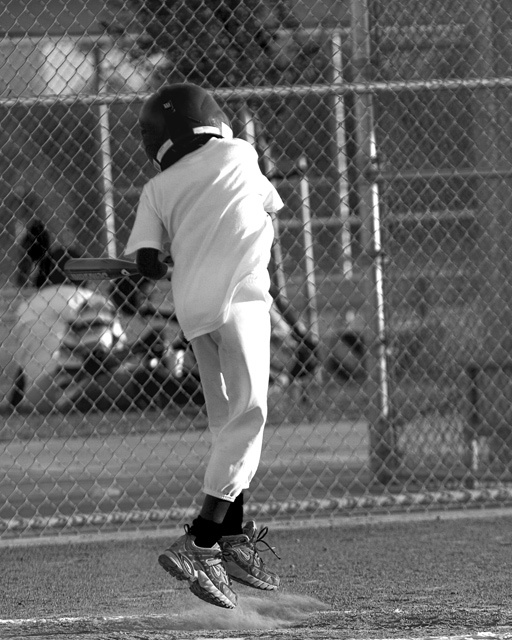 ok, if you look close enough, you can see the boy is off the ground--but only if you look closely enough. good choice for bw, but not a great choice for showing stopped motion. Good title! ;^) The dust at the feet makes this image work (along with the feet off the ground). B/W was a good choice to eliminate background distractions. Slight blur or fuzziness in the body area, and his shirt is a little hot (overexposed), are a couple of observations that could impact your score with viewers on the down side. Good luck in the challenge. Love the little jump off the ground here :-) Not much you could do about it, but I think this photo would really pop if the subject were facing the camera. The black and white tones come off well for me in this shot. Cute capture. Really got into that swing. :) I wish you'd captured from the other side to show the face, though. Proudly hosted by Sargasso Networks. Current Server Time: 04/24/2019 09:49:21 AM EDT.